I love New York.....have done all the usual touristy stuff.... September should be reasonably warm......I have been in August...too hot....February....too cold...but nice....and May...perfect! without boring yer rigid, i would say DEFINTELY GO TO BROOKLYN! i spent a day there and it was just wonderful. I'd love to do NYC - and I'm sure there's a few folks on here that could tell me how to do it. I reckon we should get a bus up for the next time Richard plays the Bowery. The reality though is that due to financial contraints I'll do Old York City again - not that there's anything wrong with that. Will follow this thread with interest - as you have to dream. Venue-wise, of the NY venues I've been to, check out Joe's Pub, which has some great acts on, but is very small. It's featured in this month's Mojo. The Mercury Lounge is in a fairly dodgy area, not far from Katz's Deli, which was featured in "When Harry Met Sally". The Beacon Theatre, further uptown is about Manchester Apollo size and very similar in vibe to the Ardwick Green venue, but with a better stage. No matter where you go, you won't be disappointed - and there'll be loads more to look for on a return visit. One of the things that is quite freaky is that everywhere looks so familiar, as the city's been in so many films and you'll recognise so many streets and locations. Do it through Dial-a-flight.com - just tell them the dates you want to go and they sort everything out. I did it through them in October 2008. Being a part-time New Yorker, I can help! It's so massive, it's almost easier to tell you what not to do, but my first rules are walk and walk and walk everywhere. A plan is good for a some time, but just wandering will lead you to discover things you never knew you'd want to see. Even knowing better, I head into town thinking I'm going to do this that and the other thing, and I end up maybe sometimes doing one thing. So pick a highlight of the day and let the rest unfold. I'm no snob about the touristy things either. Visitors get to see and do things people who live in Manhattan never do. I have friends over from the UK often, so I'm used to being tour guide and also being a bit jealous of some of the things they've done. And don't be afraid of the subways. They're not pretty and they can be confusing, having started as independent, competing lines and being run into the ground lately. But it's a simple fare system (use a card, pay upon entrance) and at many stations, you can simply turn around or change lines if you mess up. Ask for the free map at the booth (but don't hold maps on the streets). Cabs are worth it if it's late, your tired and there's 3 people, cause subway would be $6+ anyway. It can be like an amusement ride - very frightening, but you'll want stories to tell. There's all kinds of niche website with various literary walking tours, music guides, that sort of things. Sadly, my old record crawl has just about disappeared. But if you do get to do a little vinyl hunting, you can still find cool stuff. As far as hotels, there's a few I stay out when I can't book a friend's couch. Pretty much, they're listed on the Frommer's guide under the budget hotels (Larchmont, Hotel 17, a few more). You can also score deals online, but I strongly suggest, if you see something on say Priceline or one of those, you go to the hotel's website and check it out directly there and on guide sites to make sure of where it is, reputation, etc. I've had friends book 50 miles out of town, or into bed-bug ridden hovels. Just do a little web search. Cheap prices doesn't mean crap and high price doesn't mean glamor. My rule in NYC is that it's so busy and massive, bad restaurants and hotels know there's another fool along soon, so crap survives and gets big money for rottenness. I'll have a think about what sites to send you to, but if you have any questions, just ask! Always dress in layers, with some very light summer clothes for September. It can be hazy, hot and humid like the worst August days, but it also can be quite cool. You can't go wrong with jeans, light capris for the ladies, light T-shirts, cardigans for night and over-chilled stores, good rainwear, etc. Comfortable shoes are a must, forget the heels unless you have a limo. Even just going in for a night, I dress in layers, as stores are freezing, but rock clubs are broiling and it always seems to rain more in NYC (but that's just because you walk everywhere, instead of driving). It leans more towards indie rock and doesn't include everything folkie and older, but Oh My Rockness send out a nice email listing of upcoming concerts. From there you can see the various clubs and check out what they have. There's lots of free shows and in-stores. And if you have the dates of your trip already, you can sign up for TV studio audiences, such as Letterman, although it can be a bit time-consuming, they herd you like cattle for an afternoon. Instead of big meals, eat when you see cool things and get coffee at all the nice cafes and use the rest rooms there and in big bookstores. Bring money for new clothes, I think the economy is still in your favor and some places have coupon deals. Our sizes run big, and are numbered about 2 down from the UK for ladies, shoes are a few up. My list: Central Park stroll, Empire State Bldg., walk all over West Village, East Village, SOHO, Lower East Side rock club crawl, walk over the Brooklyn Bridge (ice cream and chocolate there to fuel your trip), bagels, . Hipster Brooklyn gets silly, but yeah, you can stroll Williamsburg and look for Alex Turner Oh I could go on. Do bring patience and a sense of humor though. New Yorkers are nicer than everyone says, BUT it is a city and it has its trying moments, to be sure. Crime is way down mostly where you'll be, but there's nasty people and very sad homeless situation, etc. so be wise. People go about their business. I hold doors open up in the country but in the city people just WALK FAST. Rock shows can be early or later or in the middle - check with the venue. 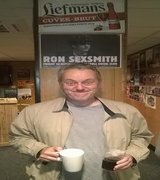 Tickets to small clubs can be cheap or even free, some caberets have drink minimums, but a night seeing bands or theater can be dirt cheap if you let it be. Also, you will need ID for bars and clubs, no matter how ancient you look. Try to be flattered. Last edited by Karen on Sun Jan 31, 2010 1:00 am, edited 3 times in total. 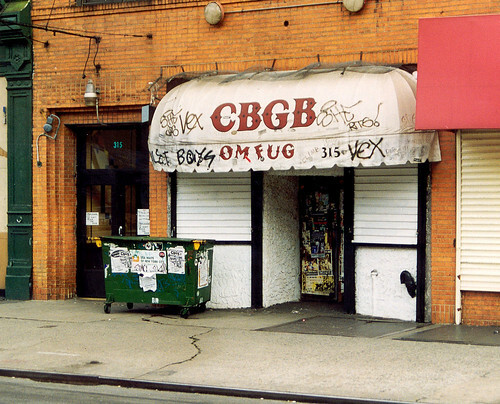 Rock and Roll Annex is closing or closed, CBGB's is a Jon Varvatos store. Got into a shouting match with a drunk rock band member outside Chelsea Hotel, got my own story now. I cry every time I pass the Dakota or go to Strawberry Fields. Lovin' reading all these threads, as yesterday I discovered my Mum and friends are taking me to New York!!!!!! Happy happy happy! I'm so happy to help anyone with their trip! All that typing was off the top of my head, so clearly, it's a scramble of ideas and such. So please let me know if you have any questions or want more ideas. I think because I've both commuted in and been a frequent evening and weekend visitor, sometimes I have more of a tourist-eyed view than friends who live in town. It's just such an all encompassing thing, I think my best suggestion is to make a little list of things you really want to see and do, but keep open to whatever just happens and just let it! Off to the city tomorrow, as it goes, with 6 free hours. It is overwhelming to think where to even start. From there, you can wander over to see the Upper East Side of Gossip Girl, etc. Wollman and the other open air skating rinks are open a few more months, not impossible like at Christmas. And of course, the gift shops of all you can usually go in without admission, if you're pressed for time and need to shop for cool things. Hey Sunflower! It is very true, just use your instincts and stick to the brightly lit rows of shops and restaurants. It's much safer than the empty shopping mall lots and vacant downtowns. Catch the subway to Coney Island.........it's another world (it takes about 45 minutes from midtown Manhattan), then make your way back through Brooklyn and cross the bridge back into Manhattan. We stayed at the New Yorker hotel on 8th Ave https://www.newyorkerhotel.com/reservat ... n=adwords1 it's directly opposite Madison Square Gardens and 2 blocks from the Empire State - we were fortunate enough to be facing the Empire State building, it loomed over us when we opened the curtains every morning. We are heading to NY in May so this is all good info'.Thanks. If anyone has the same for Nashville and Memphis that would be good as well. (Perhaps a different thread to keep it all tidy).